The surround view camera has joined my short list of must have items in bigger vehicles like this and I like that it can be easily accessed unlike some other setups I’ve tested. Apple CarPlay and Android Auto join the mix this year and that’s a good thing because Mazda’s infotainment system is generally lacking and a bit cumbersome to use because its touchscreen functionality only works when the vehicle is stationary, leaving you to use a knob and buttons. SiriusXM Travel Link is a new addition for 2019 providing info such as traffic, weather and gas prices but just look at the interface and the graphics. Maybe it works in a Mazda2 but not here. Sorry. The rear entertainment system is a nearly $2000 upgrade that feels very aftermarket and doesn’t have any tie in with the head unit. And if there’s one area in which the CX-9 still feels a step behind it’s in innovative cabin technologies. You know, like Honda’s Cabin Talk or Chrysler’s cool interactive kids’ games. Something tells me these screens aren’t long for this world. 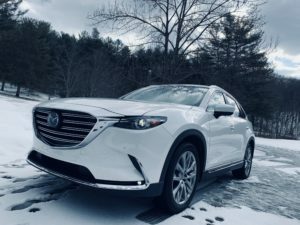 The CX-9’s turbo-4 really does get the job done in terms of power and refinement…even in a nearly $50,000 vehicle. But my mileage has been a bit disappointing. I guess it needs more SkyActiv. The suspension upgrades have added more polish to the ride and the handling is still a place where Mazda can hang its hat when compared to the competition. It’s a great drive for a mainstream 3-row. But that price leaves me wanting even more. No one uses a 6-speed anymore and even though I don’t love the feature, the lack of start-stop certainly contributes to MPG you think would be better than the V6 competitors. The all-wheel drive has done a yeoman’s job in the snow and the 310 pound-feet of torque and 250 horsepower play particularly well. However, keep in mind that if you chose to use 87 octane horsepower drops to 227. It drives and steers and moves through a backroad like a Mazda and that’s the biggest compliment you can pay it. It’s not sporty per se but it sure is competent beyond what it needs t be. You can score a CX-9 for under $35,000 but if you must have it all a fully loaded Signature is $49,230. Certainly good but not great.